With so many Brett Favre rookie cards to choose from, it should come as no surprise that there is a wide range of design styles and price ranges to collect. If there’s anything Favre wasn’t afraid of doing, it was taking a chance against tight coverage when many other quarterbacks would have hesitated. That style of play could lead to frustration for fans when it didn’t work but luckily for them, it paid off more often than not. Favre’s legendary status in Green Bay and throughout the NFL have earned him a place as one of the game’s greatest. And in this guide we’ll cover everything you need to know about his different rookie cards. At the time, the design of the 1991 Action Packed cards had an advanced look and feel to them with the gold foil and rounded corners. The Rookie Update set featured 84 players in total and Favre is by far and away the key. The "R" in the football helmet in the upper left corner adds a nice touch in design to note the rookie card status. 1991 Classic was produced as a factory set and contained 50 cards in total. The design is very straight forward with the thick borders and early 1990's style graphics. The image of Favre on the bench isn't exactly the most appealing choice but it's a decent card overall. Additionally, it's one of his cheapest rookie cards you can own. Classic also released another set in 1991 that featured not only football cards but hockey, baseball and basketball as well. The design of this card is much better than the regular Classic issue as it features a pretty good action shot of Favre dropping back in the pocket. The marble-colored borders are also a bit more appealing to the eye. This Brett Favre rookie is probably one of the weirder ones in terms of design. The grey/white color scheme of the borders along with the pink name plate looks odd and out of place. But, hey, it was the early 1990's and card companies were experimenting trying to stand out from the field. A young Favre looks extremely focused with his arm cocked and ready to launch the ball. Pro Set was a company out of Dallas that owner Ludwell Denny founded in 1988 once he gained a license from the NFL to be their official producer of football cards. Hence, the "Official NFL Card" shown at the top of this Favre rookie. To me, this is one of the better looking Favre rookie cards as it features a great action shot and balanced design elements that aren't too over the top. Pro Set also released a premium "Platinum" set that year that featured 315 different cards in total. There isn't much to the design really, except for the logo in the lower left corner. Despite it being an upscale version of the regular Pro Set, the price premium really isn't there. Many collectors don't really like the design of this card too much but I kind of like it. I've always liked the late 1980's and early 1990's score cards in general. You can instantly recognize a Score design when you see one and this is no exception with those two-tone pink and purple borders. A great action shot of Favre rounds out a simple but somehow exciting card. Notice anything unusual about this card? While his last name is pronounced "Farve", it certainly isn't spelled that way as the "V" has always preceded the "R" for some reason. That error is forgivable, however, as this is a great-looking card with imagery that pops and nice design elements along the bottom. This one is among his more expensive rookies. The price premium on this "Super Bowl XXVI" parallel of the base version is quite substantial. Pristine examples can go for hundreds of dollars. These were issued in much smaller quantities and released at the NFL Experience in Minneapolis in 1992. The design is pretty much the same as the base except you'll notice a very subtle Super Bowl XXVI mark in the upper right hand corner. Seeing as how this card contains Brett Favre's autograph on the reverse side, I would have thought it would have been worth more than it is. Don't get me wrong, top grade examples can still go for hundreds of dollars, I was just expecting a bit more. The football-laden borders on the front are an interesting choice but it's a decent-looking card nonetheless. One thing I've never understood is why so many of the autographs had the sticker of authenticity placed directly on top of them. That kind of takes away from the signature a bit. I like the blurb at the bottom about lack of mobility and inconsistency. Favre never really got over those two things but I think the inconsistency more than anything is what made him so exciting to watch. He wasn't scared to take chances and throw downfield into tight coverage and more often than not, it paid off very well for him. The 1991 Ultra Brett Favre football card can appear a bit bland to many collectors. Despite the drab gray borders and rather plain look and feel, I personally like this card a lot. I've never been a huge fan of over-the-top flashy designs so this one looks just fine to me. The image of Favre ready to pass against a blurry crowd backdrop does a great job of presenting the young gunslinger in action. 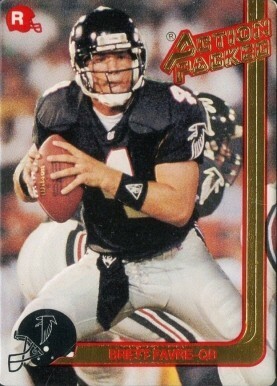 The Ultra Update card features a young Favre in his Falcons jersey and cap. Who knows what might have been had he not been sent to Green Bay? Luckily for Packers fans he made the switch and went on to become one of their most beloved players of all-time. Adding to the sweetness of this card is the fact that he was chosen to be card #1 in the set. Upper Deck has always been known for producing quality cards with great imagery and designs. I wish they had been able to choose a better image for Favre than one of him on the bench but oh well. This is one of his more popular rookie cards and it can be had for relatively cheap. Favre also appeared in Upper Deck's "Rookie Force" subset in their 1991 release. This time we see him in more of an action pose as if he has just taken a snap and started to drop back for a pass. Of his two Upper Deck rookie cards, I'd have to say I probably like this one a bit more based on the imagery. This one can be had for around $15 - $20 in top condition as well. These are some of the most expensive Brett Favre rookies you will ever come across. The 1991 Wild Card Stripes offered collectors a base version "1st Edition" as well as parallels that had a stripe in the lower left corner with either a 5, 10, 20, 50, 100, or 1,000 on it. The stripe cards were meant to be redemptions that collectors could send in for base versions of each player totaling up to the amount listed on a particular card's stripe. Sounds kind of odd, I know. The stripe parallels typically sell from between $100 for the 5 stripe version all the way up to thousands of dollars for the super rare 1000 stripe version. The design of these cards screams 1990's but I think the concept of these cards was a fun thing to try. Brett Favre was hands down one of the most exciting quarterbacks to ever play the game. The guy had no fear and wouldn't hesitate to throw it downfield into coverage. That style of play earned him a reputation as a gunslinger. Sometimes that aggressiveness would result in interceptions or other turnovers but more often than not, it worked out well for the legendary quarterback. He goes down as one of the greatest NFL players of all time and is nothing short of a legend to Green Bay Packers fans. He was inducted into the NFL Hall of Fame in 2016.